Congress released it manifesto on Saturday. 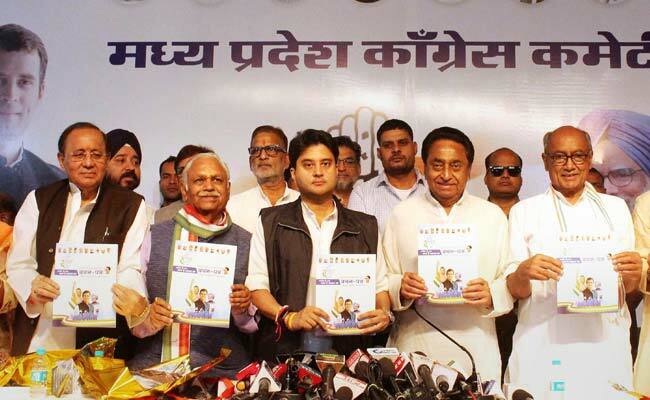 The Congress's manifesto for the Madhya Pradesh Assembly polls, pledging a ban on holding RSS shakhas on government premises and stopping government staffers from attending those has raised the heckles of the ruling BJP in the poll-bound state. Bharatiya Janata Party (BJP) spokesperson Sambit Patra, vice-president Prabhat Jha and Madhya Pradesh unit chief Rakesh Singh hit out at the Congress on Sunday, accusing it of being opposed to Lord Ram. The Congress manifesto also talks about withdrawing a relaxation given to state government staffers to attend shakhas (class) conducted by the Rashtriya Swayamsevak Sangh (RSS). "The Congress believes in mandir nahin banane denge, shakha nahin lagne denge (won't allow the temple, won't allow shakhas). These are the very people who had earlier said that Lord Ram did not exist, that he was a mythical character. That's why they were opposed to the construction of the Ram temple," Mr Patra told reporters in a hurriedly-convened press meet here. "Kapil Sibal (senior Congress leader and lawyer) had objected to the hearing of the Ram temple issue in the Supreme Court before 2019. The Congress's ideology appears to be mandir nahin banane denge, shakha nahin lagne denge. "This is a consistent effort by (Congress chief) Rahul Gandhi and the Congress party to demean the efforts of the RSS," he claimed. Hitting out at former Madhya Pradesh chief minister Digvijay Singh, Mr Patra said, "Digvijay Singh has also said that the RSS should be banned. He had referred to terrorist Osama bin Laden as Osamaji and also called Zakir Naik, on the run now, an apostle of peace." Zakir Naik is a controversial Islamic preacher who has been living abroad to evade arrest in various cases related to hate speeches and money laundering in India. "And post 26/11 (Mumbai terror attack), he (Digvijay) had said 26/11 was the RSS's conspiracy and tried to give a clean chit to Pakistan. The same Digvijay Singh calls for a ban on the RSS today," Patra said. "This is nothing but the politics of appeasement followed by the Congress. It reminds us of the days of Emergency of (former prime minister) Indira Gandhi," he added. "For Rahul Gandhi and the Congress, urban Naxals are the best-performing NGOs of India, while the RSS, which is known across the globe for its humanitarian approach, is being defamed," Patra said. Mr Jha told reporters in Mandsaur district of Madhya Pradesh that former prime ministers Jawaharlal Nehru and Indira Gandhi had banned the RSS, but their moves had boomeranged. "Rather, the RSS then grew stronger and expanded manifold. No one can stop the RSS as it is a cultural organisation. It is the biggest cultural organisation in the world. The threat of the Congress against the RSS will boomerang and sink the party," he later told reporters here. Singh too lashed out at the Congress, saying the opposition party's remarks against the RSS signalled its "beginning of the end". "I challenge the Congress to impose a ban on the RSS if it has the strength," he said. Meanwhile, Congress spokesperson Priyanka Chaturvedi said, "The RSS, while it calls itself a cultural organisation, is busy pushing and aggressively promoting a pMr olitical ideology and a political party." In Indore, senior Congress leader P Chidambaram described the RSS as a political organisation and defended the Congress manifesto. "They can deny it to whatever extent but the truth is that the Sangh is a political organisation. This organisation has a political agenda," he told reporters. "After coming to power in Madhya Pradesh, the Congress will fulfil its election promise by banning the government staffers' tendency to participate in RSS shakhas," the former Union minister told reporters. "The people of the state will welcome it, because government staffers should not get connected to a political organisation," he said.